BREAKING NEWS: 2018 Bracket Leaked! In a disconcerting turn of events, the Supreme Executive Committee has confirmed that a portion of the 2018 Lent Madness bracket has been illegally leaked online. The hack into the Lent Madness system comes just ahead of All Brackets’ Day on November 3rd, when the entire bracket of 32 saints will be officially released to the public. “We’re pretty sure it was the work of the international hacking organization LentiLeaks,” said Lent Madness founder Tim Schenck. Unless there are further leaks before November 3rd, the SEC assures everyone that the full bracket will be revealed, per tradition, on All Brackets’ Day. 62 Comments to "BREAKING NEWS: 2018 Bracket Leaked!" It’s a mad, mad, mad, mad world! Thanks for the heads up for All Brackets’ Day. God Bless Ya’ll! Duly placing a notation in the calendar for All Brackets Day with gratitude and joyful anticipation for the return of Lent (Madness). Thanks for the topical reminder! Is nothing sacred anymore? ?? If we see an inordinate amount of Russian Orthodox saints in the bracket, it can only point to one conclusion. I thought the same thing! Hackers! Personally, I want to experience Advent, the Christmas Season, and Epiphany before I ever think about Lent. Even the Society of St. John the Evangelist is rushing the seasons. I feel like I am in the department store and seeing Christmas stuff before Labor Day. Can we all please SLOW down and enjoy the seasons of the Church year as they unfold? I hear your pain. For those of us tasked with organizing Lenten activities – and with a diocesan magazine that goes out four times a year, we need to be able to plan and get work done in advance. Maybe there should be an inside track for the likes of myself so that others can opt out of unseasonal notifications. I have to admit that I’ve brought up the Jesse Tree box, but only because the week before advent starts, I’m doing a workshop on it. So this is my prep time. It will stay in the tote until I need it. Just now getting fall stuff up. Take it one day/season at a time. No love Lentils! So good for you. Never did like lentils but love Lent Madness. I can wait until November 1st for the full disclosure on the Bracket. Would love a counterpart for Advent but Advent is busy enough, right? 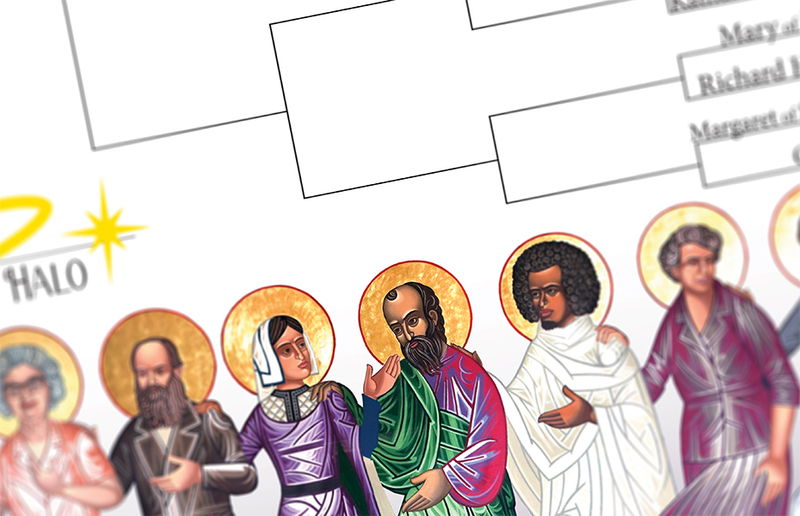 I look forward to the bracket of saints as part of my All Saints celebrations. The partial bracket of Lent Madness Saints? The evil of temptation and who hacked? Does a byzantine technology system give an unfair advantage to eastern saints? Latin Rite constituents: wake up and smell the Türk kahvesi! Will there be any play-in rounds? Please, please do some play-in rounds! Advent, Schmadvent. I want Lent! Also, thank you for the All Saints present. My husband and I were married on Nov. 1, All Saints Day that year, although he continues to tell everyone that our anniversary is Day of the Dead. This produces a lot of eye-rolling from our priest. Hahaha! Quite the funny guy, your husband! A pox upon the ingrate ! Is nothing sacred anymore? We have enough to deal with….with which to deal ??? without irreligious louts hacking into LentMadness ! A thousand lashes with a wet noodle..Well, a bunch of them. Carry on Padres ! This is an outrage. Our saints in contention are pinwheeling in their graves and reliquaries (siq). Is that Dame Edna on the far left? and Eleanor R on the far right? Eleanor R would never be caught dead on the far right. Inform Barry Humphries IMMEDIATELY! Oh, another comic genuis to add a voice to Lent. l to r: Agnes Sanford, Fyodor Dostoievski, Marguerite de Porete, Paul of Tarsus, Moses the Black, Eleanor Roosevelt, and a tiny bit of Li Tim Oi’s arm. Not only is it right before All Brackets Day, but Tuesday is the 500th Anniversary of the Reformation – is there a connection there?????? My car is being repaired overnight between Nov. 2 & 3. Thank goodness I have Bracket Day to take away my pain. My car will be in the repair shop on Nov. 2 and 3. Thank goodness I have this to look forward to and not just a terrible bill. Sorry for the repetition. I am excited. I hear the scoundrel, Julian of Lentileaks, has taken refuge in the Vatican! At least, no one is blaming Hillary or President Obama for this debacle! As for me, I plan to celebrate All Saints at The Holy Ghost Wiener Roast here in lovely Wilmington, OH. Then, on with the next Madness! This leak is the work of the Holy Spirit who wants us to remember the 500th anniversary of the Reformation! Which is it? Lentils? Or leeks? Those scoundrels! Is nothing sacred? My oldest brother was born a twin on All Hallow’s Eve. The two boys were baptized on All Saints Day and one of the twins died on All Souls Day. I have always had a special place in my heart for those three days…that “Fall Triduum” as it were. Now I can add in All Brackets Day to my holy remembrances. So if anyone messes with My Holy Days, I’m gonna have WORDS with them! Will Korean nukes take aim at your city? Skye and Hope have returned – we are now in 8th grade. After use of magnifying glasses and much thought, they think that the lady in the glasses the far right looks like Eleanor Roosevelt. Sad. Not nice to hack! October 26, All Hackets Day. Fake news leeks. Someone sang too early. Ooh Mary? Richard? Margaret? What a bracket teaser! Looking forward to Wednesday when All the saints come marching in. The devil made them do it! Does anyone have a recipe for lentileek soup? Bring it on I can hardly wait. Lentils and leeks-quite a stew! Looking foward to All Brackets’ Day! Have a Blessed Fall Triduum! « Lent Madness Play-In Round at EYE!